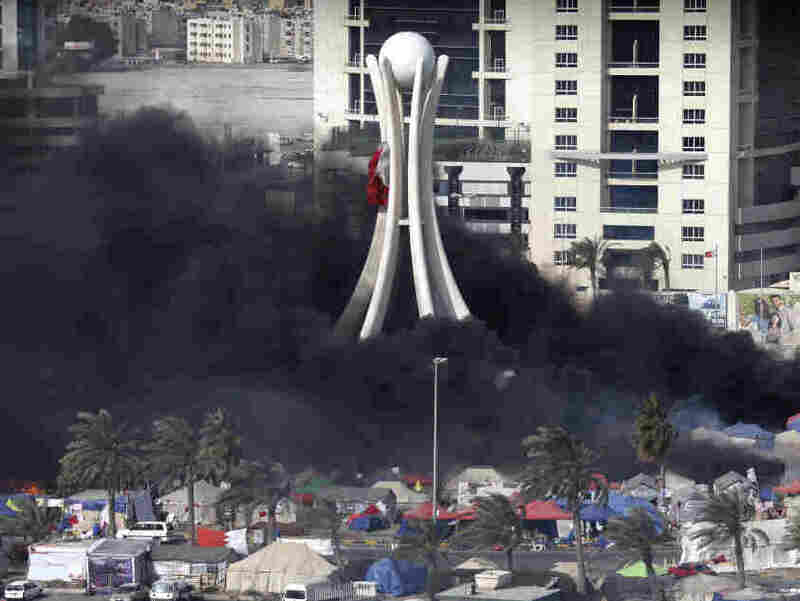 In Bahrain: Protesters Fear Mass Arrests Are Next : The Two-Way Police fired tear gas and pushed protesters out of a central square in Bahrain's capital early today. Some witnesses told reporters that at least six people were killed, The Associated Press reports. Black smoke billowed from burning tents in Pearl Square in Manama, Bahrain, earlier today (March 16, 2011). Police and national guard troops fired tear gas and pushed protesters out of a central square in Bahrain's capital early today. Some witnesses told reporters that at least six people were killed, The Associated Press reports. Reuters says three police officers were killed when they were struck by a car. NPR's Frank Langfitt, who was at the scene in Manama, says the mostly Shiite protesters who fled from the show of force now fear that authorities (dominated by Sunni Muslims) will sweep into neighborhoods and begin making mass arrests of those who have been pushing for reform in the kingdom. And one man Frank spoke to by telephone said that his Shiite neighborhood was virtually locked down and that "you cannot go out of your house without getting shot at." Here's the conversation Frank had with Morning Edition host Renee Montagne earlier today. Update at 7:05 p.m. ET: In an interview with the BBC, Secretary of State Hillary Clinton said that Bahrain was on the "wrong track." "We deplore the use of force against demonstrators," she said. "And we deplore the use of force by demonstrators. We want a peaceful resolution." In another development, the BBC reports that Bahrain's health minister resigned in protest today. Update at 5:49 p.m. ET: As we reported earlier, the state news agency says its forces fired when fired upon. But one widely circulated video posted on YouTube is casting the crackdown of protesters in a tough light. In the video, which we won't embed here because it's much too graphic, a man takes off his shirt and puts his arms in the air to show authorities he's not armed. Still, the man is shot in the thigh and is rushed into a car. In the description almajed414, the person who uploaded the video, says they tried to take the man to the Salmaniya Medical Complex, but hospital, as has been reported by the BBC and others, is under lockdown. The man, he says, is being treated in a house. Almajed414 later posted a video of the man with an oxygen mask being treated in what looks like an average home. "The security forces carried out the evacuation operation carefully for the sake of safeguarding the lives of those present at the Roundabout," the Interior Ministry's Spokesman affirmed, noting that criminal evidence experts are collecting evidence in order to take the necessary legal procedures. Update at 1:37 p.m. ET: As Frank Langfitt reported yesterday, the clashes in Bahrain have very much become sectarian: A Sunni royalty presides over a Shiite majority. Alive in Bahrain, a website that is devoted to capturing voices in the country and translating them for the rest of the world, just posted a video that gets to the heart of the matter. The video is of a woman caller to state TV, who is so emotional in her pleas that by the end of it, the host is in tears. The woman supports the king and blames the chaos in Bahrain on Iran, a country very much influenced by Shiite clerics. Based on Alive in Bahrain's translation, she says that the Sunnis call on the government to end the demonstrations. "What negotiations?" she screams. "They (the protestors) are killing us." The full video, which is worth your time, is here with English subtitles. Despite rumors, US has been clear in public and private that we support peaceful political process that meets aspirations of all#Bahrainis. Update at 12:28 p.m. ET: Al Jazeera reports that six people are dead and hundreds injured, after government forces cleared the Pearl roundabout in the capital city Manama. Al Jazeera also reports that it appears that foreign forces that were brought in Monday to tamp down protests didn't play a role in today's actions. Their video shows how armored vehicles and helicopters moved into the square and opened fire on protesters.